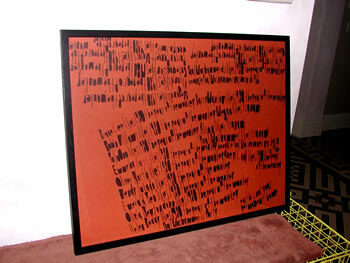 There is a particular challenge in attempting to create visual art from words. To look at a word is inevitably to contemplate its meaning in additionand often supplanting the approachto viewing a word as a shape. More possibilities have opened up due to the effect of the internet technology on writing poems. To date, I've found such "visual poetry" onscreen more engrossing and innovative than what I've seen on canvas or paper (particularly the work of Jukka Pekka-Kervinen, of which a sample is available at http://xpressed.sdf-eu.org/cgi-bin/moving.cgirefresh the page to get a new poem each time!). All this made me ever more appreciative of John Patrick McKenzie's non-virtual drawings. McKenzie, born in 1962 in the Philippines, is a visual poet who makes me appreciate his works from the same visually-oriented point of view from which I view visual art. He uses words but displays them through a font that he's created, resulting in art works that are unmistakably by "John Patrick McKenzie." Through his manually-made font, he's created a signature style, a voice so unique that his works are instantaneously recognizable as his own. McKenzie pays attention to his environment and his observations from watching T.V., from engagement with others, and so on texts that he writes out on drawing paper. After writing, or drawing, his words, he goes back and colors in various spaces within certain letters, for instance the spatial areas created by curvatures in the letters "a," "c," "m," "h," "e" and "b." The resulting drawings allude to certain visual art tropes, e.g., the pattern and "all-over" imagery across the fields of paintings and drawings. The font also evokes other visual, versus textual, references. For instance, the tops of the first line of "Julie Villota is sixty" look like people in a distance, huddled together and holding hands. (McKenzie's works do not have specific titles so references are based on the first line of his drawings.) 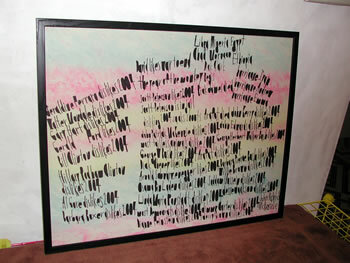 Bonnie Grossman, of Boston's Grossman Gallery, has likened McKenzie's font to "a musical score." The imagery is certainly not static. A certain rhythm is implied by the patterns. It's not a stretch to imagine a line of dancers going back and forth across the page. McKenzie also is attuned, from a sculptural perspective, to surface. 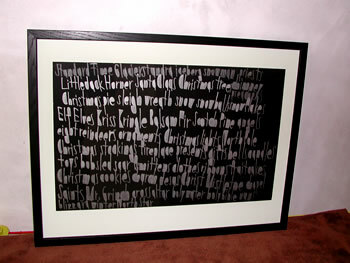 The work whose first line is "Aaron Noble is getting old" uses white, chalky "ink" that is very effective against the piece of black velvet upon which he's drawn his poem. 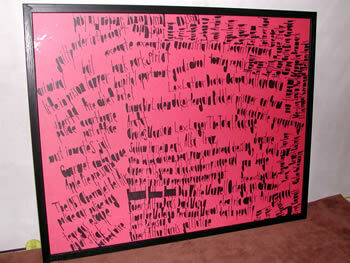 A work like "Liberia Nigeria Egypt" is also effective as black pink against a pastel-colored backdrop. In another work (not shown here), "The Incredible Hulk is mad," the use of red ink against a gold foil backdrop is pleasingly lush. McKenzie's talent has caused him to have an enviable artist resume with shows at such venues as Southern Exposure (San Francisco) and the Outsider Art Fair (New York) as well as various commercial galleries in New York, Massachusetts and California. His work has sold for four-figures, received positive critical reviews, and been collected by collectors in the Bay Area, where he resides, as well as Michael Stipe of the band R.E.M. His works, therefore, can be appreciated for their own merit. We need not know anything else about the artist, John Patrick McKenzie. But to know of McKenzie's work is inevitably to discover that he is autistic. In fact, I discovered his drawings while gallery-hopping in New York. I came to visit an exhibition at Chelsea's Ricco/Maresca Gallery entitled "Autism/ Asperger's Art." Autism is a series of developmental disorders with varied manifestations. It is also a major epidemic, reported by the Centers for Disease Control and Prevention to be the fastest-growing developmental disability. One in 166 children being born are now diagnosed as autistic on one level, versus the estimate of 1 in 10,000 about a decade ago. At current growth rates, that statistic can rise as high as 1 in 7 children by 2015, according to AutismAwareness.com. It is a frustrating matter as no one can really pinpoint the cause of autism, and social, political and health policies have yet to catch up to the ramifications. Through the Ricco/Maresca exhibit, I learned that McKenzie lives in San Francisco and that his art works are produced at Creativity Explored, a nonprofit visual arts center where people with developmental disabilities create, exhibit and sell art (http://store.creativityexplored.org/). McKenzie, who has been attending Creativity Explored for about 16 years, is their biggest seller. Should McKenzie's art be considered by different standards because he is autistic? His works are as compelling as other (non-autistic) artists who work or have worked with patterns and obsessive repetitioncontemporary artists like John Morris, Maureen McQuillan and Theresa Chong. Though autism takes on as many diverse forms (from complete withdrawal to social ineptness) as art itself, one cannot avoid acknowledging that McKenzie's works do reflect his conditionif only because for all artists, one's self or identity inevitably can affect one's art. McKenzie's process hearkens how certain autistics have difficulty integrating various sensory inputs they receive; for McKenzie, drawing the words he hears or reads from his environment may provide the means of processing information. The nature of McKenzie's imagery also befits the obsessive trait known to be associated with autistics. Dr. Larry E. Dumont, Director of Inpatient Child and Preadolescent Psychiatry, KidsPeace Hospital (Orefield, PA) and the curator of the Ricco/Maresca exhibit has said, in fact, that all artists are autistic in that all artists are obsessive. But Dumont also notes that, among autistic artists, there are good as well as bad artists. An obsession with repetition might explain McKenzie's works, but he still made aesthetic decisions that make his drawings more effective in pleasing the viewer. For example, in "Bruce Lee likes 1980," he didn't cover the entire drawing with words. This would contrast with a friend who said his autistic son, in his drawings, would have covered every single inch of the page. McKenzie's allowance for blank spaces, on the other hand, creates a floating effect for his words which serves his drawings well. In fact, the visual effectiveness can be seen in how this drawing's first five lines are inscribed upside down (McKenzie must have turned the paper around at some point in the process of drawing his words). McKenzie's poems can also be aphorisms, such as this couplet on a black t-shirt for sale at the gallery: "most tailless animals / do not like war." (See image of t-shirt at http://store.creativityexplored.org/antiwartshirt.html). The United States strikes back at Sudan and Afghanistan. Safeway Store is already shut down for a long time in Ocean Street. Bill Clinton likes Klondike Vanilla Ice Cream and Neapolitan Ice Cream in Safeway Store in Sixteenth Street. 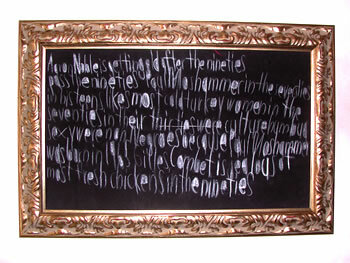 Yet McKenzie transcends the binary between poetry versus visual art. 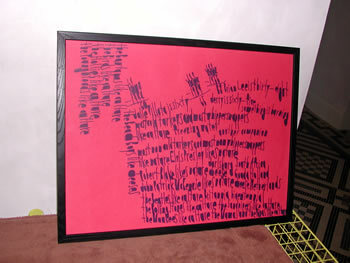 His drawings are at balance between the two options to create a third new result: visual poetry. In a work (not shown here) such as "The Beatles like tsunami," for instance, there is a harmony between the choice of a round format and allusion to tsunami. In this drawing, McKenzie used a round piece of cardboard painted white (like a page) before he inscribed his text. The roundness hearkens a vortex, as can be imagined in a whirlpool of water in which one drowns. This drowning effect also is elicited by having to read the words inscribed circularly against the cardboard. 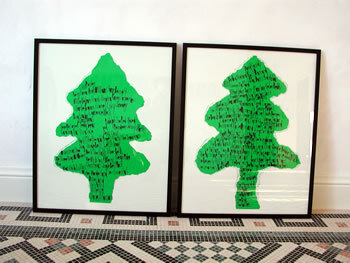 I believe it's telling that of the works I've seen, McKenzie's least effective for me are two drawings made after he first shaped green paper into Christmas trees. Obviously, these were part of a Holiday-oriented program at Creativity Organization. Here, the Christmas tree drawings evoke the feeling of craft as can be made by someone with no particular artistic talent. In the drawings, there is a sense of something forced or artificial (as in the arbitrarily applied theme of the holidays). On the other hand, when left to his own devices, McKenzie's imaginations result in art that meets both the visual and the poetic criteria in a harmonious way. As such, McKenzie makes words transcend meaning and makes visual shapes meaningful. Thanks to Jim Ryals, writer and special education lawyer, for his advice in writing certain aspects of this article. I think that this is a theory that I've heard experts propound in the past, so you are probably as accurate as they are. The description of lack of organization she describes makes sense, given the theory that autistics, among other issues, have a hard time integrating the various sensory inputs they receive. As regards this article below, I'ma thinking that the use of words is a way for McKenzie to "control" a world that can be chaotic...hence his drawings using words....whatcha think? Feb. 28 issueSue Rubin doesn't remember much about the first 13 years of her life: "Sadly, I was locked in autism." And from inside that locked-up place, "I actually only remember waving to regular school" and at regular life. "That's a nice way to put it, Suze," her mother, Rita Rubin, says ruefully. Sue used to beat her head against the concrete floor at her school, and regularly bit, kicked and pinched her parents. She was considered severely mentally retarded, with an IQ of 24, and through years of what her mother calls "every therapy you can imagine," she remained utterly unresponsive. "Holding Sue was like holding a sack of potatoes, because you got nothing back," Rita says. That slowly began to change in the fall of 1991, after a school psychologist in Whittier, Calif., where the Rubins live, suggested that Sue try communicating with a keyboard. "As I began to type, my mind began to wake up," is how Sue, now 26, describes all that followed in the screenplay for "Autism Is a World," a documentary about her life by Gerardine Wurzburg. In the Oscar-nominated film, Sue writes about how words themselves became her way-not out of autism, but into the wider world. A year after Sue began to type, she enrolled in mostly honors and advanced-placement high-school classes, eventually graduating with a 3.98 grade-point average, scoring 1370 on the SAT. Today she's a junior history major at Whittier College and lives semi-independently, with an aide, in her home a few blocks from campus. In a paper she presented earlier this month, she wrote, "It was only after I began to type that my brain became organized enough to understand what was going on in the world around me ... I became aware of people and their killer personal lives. I also realized the world was larger than Whittier, California ... I began listening to the news and reading the newspaper ... Thinking about world events wouldn't seem to have anything to do with learning how to control autistic behaviors. However, that is what happened. As I became more aware of the world around me I also became more aware of myself and my autism."